Stems: Several to many, branching above, strongly 4-sided (square in cross-section), glabrous or sparsely spreading-hairy. Leaves: Mostly opposite or uppermost rarely alternate, ovate to triangular-ovate to lanceolate, 4 to 16 inches long, 1 to 9 inches wide; bases united around stem, forming cup; tips pointed; margins coarsely-toothed to nearly entire; surfaces rough; stem leaves progressively reduced above; basal leaves absent or withered at flowering. Inflorescences: Loose, open clusters of numerous heads, terminal; heads 2 to 2.8 inches across, on stalks to nearly sessile; involucre .6 to 1 inch tall; involucral bracts in 2-3 series, elliptic to broadly ovate, .5 to 1 inch long, glabrous; tips pointed; margins minutely-fringed. 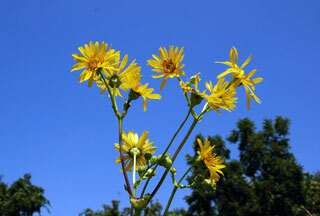 Flowers: Ray florets 17-35, ligule .6 to 1.6 inch long, yellow; disk .6 to 1 inch across; disk florets 85-200, yellow. Fruits: Achene, egg-shaped, .3 to .5 inch long, glabrous, with prominent wings, deep narrow notch at tip; pappus absent. Habitat: Low, moist sites, stream banks, roadside ditches, margins of lakes and ponds, open woods, thickets; partial shade; moist soil. Uses: Native Americans inhaled the smoke from the burning plant to alleviate head colds, rheumatism, neuralgia, and pain. The roots were boiled and the liquid taken to induce vomiting and for back and chest pain. Poultice of moistened, dried root was applied to wounds to stem bleeding. The Iroquois placed soot from burned roots on children's cheeks to prevent them from "seeing ghosts". Comments: From Latin per "through" and folium "leaf", alluding to the stem going through the united leaf bases.